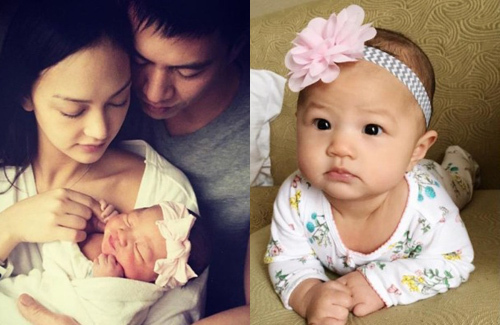 Model Jessica C and actor Andy On (安志杰), welcomed their daughter Tessa this March. Despite making a comeback to work after a temporary parental hiatus, Jessica and Andy are eager to be there for their daughter’s milestones. Already 3 months! They grow so fast. Cute baby! Lovely kid. J C looks more alluring now that she is settled, have a baby and giving her all to her motherly instinct. But believe at 1 point in time, she was always gushing over how she and Andy, Andy, her relationship, etc – was annoying but like Grace Chan. So, everybody, girls sometimes gush, excitably – annoying, maybe, but nothing more than that. So don’t dislike them. Aww baby Tessa looks just like daddy. She will be a beautiful girl when she grows up.